It does not get much more off the beaten track than this. Snuggled between three countries - China, the Democratic People's Republic of Korea (DPRK) and Russia - in the extreme southeast of Jilin province in Northeast China, is a city called Hunchun. The city, whose name roughly translates as fine jade spring, and which some have dubbed the gateway to Japan, is small by Chinese standards, with a population of just 250,000. Its location in the Yanbian Korean autonomous prefecture, one third of whose population is ethnic Korean, gives it an even more exotic feel. However, as much as Hunchun has pretensions as a tourist center, such ambitions are vastly overshadowed by the success of Jilin's top tourist attraction 230 kilometers or so to the southwest, Changbai mountain, which feeds the 520-kilometer Tumen River that flows by Hunchun on its way to the Sea of Japan and forms part of the boundary between China, the DPRK and Russia. However, even though Hunchun is a tourism minnow in relative terms, authorities are determined to draw on its remoteness as an advantage, the attractiveness of its landscape and its proximity to two major waterways, the Tumen and the great Yalu River. But for Hunchun the trump card is its proximity to the DPRK, perennially billed as "the hermit kingdom", which seems only to increase its allure as a tourist attraction. Until a few years ago, even if the border was not hermetically sealed to Chinese, tourism was tightly controlled, being limited to large, organized groups. That changed three years ago when it became possible for Chinese to venture across the border in cars, albeit with an appointed guide. 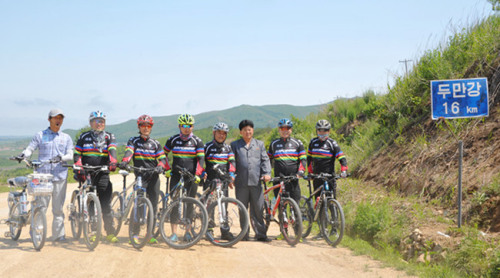 Since then that liberalization has extended to two wheels, non-motorized ones at that, and Hunchun is now beginning to benefit from that with organized two-day bicycle tours into the DPRK using Hunchun as a staging post. On July 4 and 5 about 10 cyclists completed the inaugural tour, which officials of the tourism bureau in Hunchun say are part of a joint program by the two countries to diversify cross-border tourism and to promote the Greater Tumen River Region.